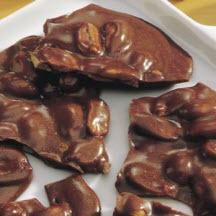 Peanut brittle alone is almost irresistible, add chocolate to the mix and it becomes completely irresistible! Lightly butter a cookie sheet; set aside. In small bowl, stir together cocoa and baking soda; add butter. Set aside. Remove from heat; stir in cocoa mixture. Immediately pour onto prepared cookie sheet. With tongs or wooden spoons, quickly spread and pull into 1/4-inch thickness. Place cookie sheet on wire rack; cool completely. Snap into pieces; store in tightly covered container.